Each year, thousands of people fire up their grills, stoke up the coals and break out the steaks for the start of barbecuing season. Grilling is one of the best “no muss, no fuss” food preparation methods. It’s also a low-fat preparation method and has natural flavoring properties. Although most of the time you’ll be thinking about the delicious food that’s on the menu, keeping your family and friends safe and healthy should also be on your radar. The Centers for Disease Control and Prevention estimate that each year one in six Americans (or 48 million people) becomes ill, 128,000 are hospitalized, and 3,000 persons die of food borne diseases. Thaw safely. Completely thaw meat and poultry before grilling so it cooks more evenly. Use the refrigerator for slow, safe thawing or thaw sealed packages in cold water. For quicker thawing, you can defrost in the microwave if the food will be placed immediately on the grill. Marinate in the refrigerator. A marinade is a savory acidic sauce in which a food is soaked to enrich its flavor or to tenderize it, and it’s a great way to add flavor to food. Make sure to marinate food in the refrigerator, not on the counter. If some of the marinade is to be used as a sauce on the cooked food, reserve a portion of it before putting raw meat and poultry in it. If the marinade used on raw meat or poultry is to be reused, let it come to a boil first to destroy any harmful bacteria. Keep cold foods cold. Keep meat and poultry refrigerated until you are ready to use it. Only take out the meat and poultry that will immediately be placed on the grill. Keep everything clean. To prevent food borne illness, don’t use the same platter and utensils for raw and cooked meat and poultry. The harmful bacteria present in raw meat and poultry and their juices can contaminate safely cooked food. When you are taking food off the grill, use a clean platter. Don’t put cooked food on the same platter that held raw meat or poultry. Any harmful bacteria present in the raw meat juices could contaminate safely cooked food. Precook to reduce grilling time. Precooking food partially in the microwave, oven, or stove is a good way to reduce grilling time. Just make sure that the food goes immediately on the preheated grill to complete cooking. Cook foods thoroughly. Cook food to a safe minimum internal temperature to destroy harmful bacteria. Meat and poultry cooked on a grill often brown very fast on the outside. Use a food thermometer to be sure these foods have reached a safe minimum internal temperature: whole poultry, 165°F; poultry breasts, 165°F; ground poultry, 165°F; ground meats, 160°F; beef, pork, lamb and veal (steaks, roasts, and chops), 145°F; and let it rest at least three minutes before serving. Never partially grill meat or poultry and finish cooking later. Keep hot foods hot. After cooking meat and poultry on the grill, keep it hot until it’s served – at 140°F or warmer. 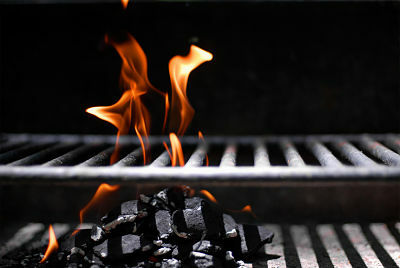 Keep cooked meats hot by setting them to the side of the grill rack, not directly over the coals where they could overcook. At home, cooked meat can be kept hot in the oven set at approximately 200°F, in a chafing dish or slow cooker, or on a warming tray. Taking the extra precautions to grill properly ensures that your friends and family will enjoy themselves during and after your barbeque. No one wants to get sick! 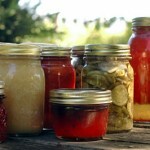 Important guidelines on how to safely preserve your food this summer! Read more to learn about atmospheric pressure canning, as well as how to safely preserve your vegetables.